You can signup to our TestFlight builds by acessing this link: https://testflight.apple.com/join/3gcYeoMr. For discussion and feedback on the latest TestFlight build, please access the #ios-beta channel on our community server. Also check the community on open.rocket.chat. We'd like to help. If you found a bug, please include the current version number (Sidebar > Dropdown > My Account). Please also mention the device. Some features only work with newer versions of Rocket.Chat servers, you can get the current version number (even if you're not admin) via https://chat.server/api/info. Please include as much information as you can provide. E.g. try to write down steps to reproduce the bug so we can investigate. If you would like to help, see how to contribute. The app can't connect to your server? Make sure your server supports WebSocket as well as SSL. Apache supports WebSockets from 2.4 on, Nginx with 1.3 or greater. Are you an iOS developer and would like to help? Found a bug that you would like to report or a missing feature that you would like to request? Great! We have written down a Contribution guide so you can start easily. Choose from 3 new themes to take you from day to night. 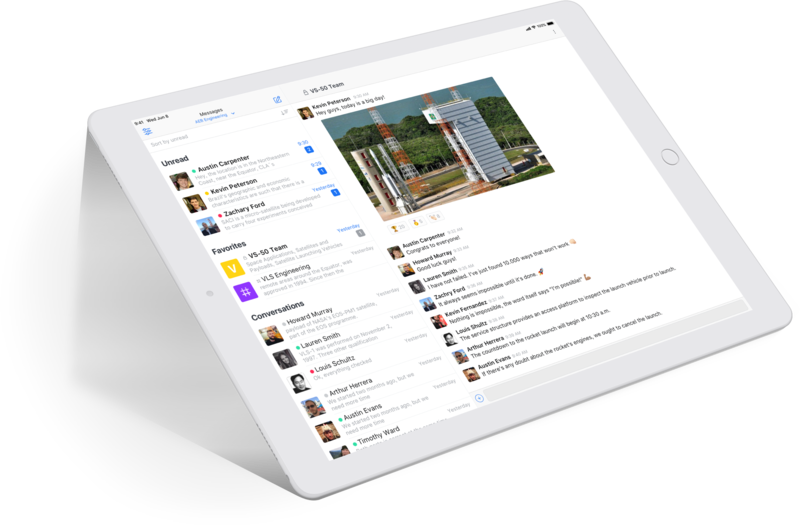 We have developed an exclusive experience for iPad users: you can now multitask by using Rocket.Chat at the same time as other apps.